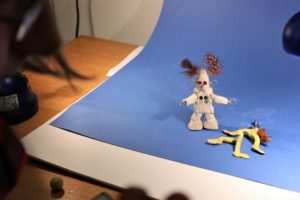 Stop motion is an animation technique to make a physically manipulated object appear to move on its own. The object is moved in small increments between individually photographed frames, creating the illusion of movement when the series of frames is played as a continuous sequence. Clay figures are often used in stop motion for their ease of repositioning. Motion animation using clay is called clay animation or clay-mation, (eg “Wallace & Gromit”). This fun course allows you to try stop motion animation using many different materials and add sound and music. No experience required! 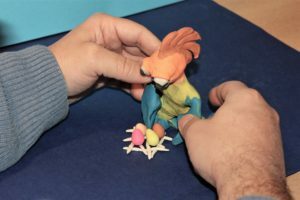 Morning: An introduction to Stop Motion Animation Techniques, the principles behind it and examples of different animation styles. Students will get to try out the equipment, and discuss a theme for the final film. Afternoon: Students will create very short test animations in groups using different materials, the emphasis being on experimenting and getting a feel for how materials look on camera and creating movement. The group will draw up a storyboard for the final film. Morning: Students will create a short animated film in groups, taking it in turn to direct the action. Afternoon: Students will edit their film, add sound, titles and so on, finishing with the grand Premiere! Iona Fabian has 19 years experience working in the media industry. After three years working on all stages of production for a Corporate Video Company, she decided to go freelance and has worked on a wide range of projects, Producing, Directing, Camera Operating, Sound Recording, Editing, Animating and Creating Motion Graphics and Special Effects. She has experience of Lo-Budget through to Broadcast production, and of working with professionals and beginners. She is currently enjoying working with DSLR cameras, and developing ‘filmic’ looks in Post Production. Clients include ITV, Ugandan Television, The Royal College of Surgeons, Butterworth-Heinemann, Mercruiser. She has also been involved in training and education throughout this time, training professionals and beginners in many different contexts. She was very involved with the Creative Partnership Scheme working in schools, has been involved with several Firstlight Projects and teaches at Film Oxford, as well as individual professional training. 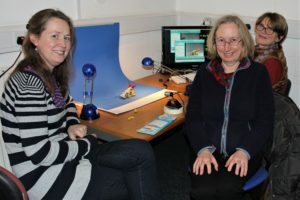 Having first explored Stop Motion Animation at University producing four animated shorts she continued working with Stop Motion, particularly in education including being Artist in Residence at Chalfonts Community College. She has run many projects creating animated shorts with collage, plasticine and drawing techniques. In this course, she will show you several techniques and share the magic that is animation. It is guaranteed to make you smile at least once! Very pleased with having been able to produce two complete mini-animations. H.P. Fantastic! Really enjoyable weekend. I’ve learnt so much and had fun. H.P. Lovely to be able to work on our own project making our own props and ideas with free rain but with lots of guidance and help. W.C.
All Film Oxford Courses are subsidised by Oxfordshire Adult Learning.